I bet most Americans are unaware of this shovel ready dhimmitude, where millions of US taxpayers dollars have been spent restoring mosques and religious 'cultural heritage' sites, worldwide (other than Christian or Jewish ones) in 'outreach programs' in states that sponsor terrorist and grow jihadis. 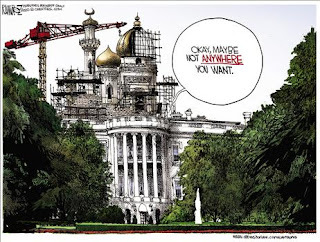 Under the direction of two Administrations those of both G. W. Bush and B. H. Obama, our government has engaged in the Constitutionally questionable activity of repairing and restoring mosques and other religious 'cultural heritage' sites worldwide. This misguided foreign policy political correctness has us waging war, while appeasing and playing at peace with states who harbor bases for terrorist at the same time. This schizophrenic bipolar practice has been employed by both Administrations, and also approved in budgets from both legislative branches, and signed into law by both of these Presidents. Under the executive leadership of both the 43rd and 44th President, the Department of State has implemented this Catch 22 program through the auspices of the United States Agency for International Development (USAID) to spend millions reconstructing and financing multiple mosques in Cairo and Cyprus, Somalia and Indonesia (just a few of the states on the USAID list) as well as providing computers for imams in Tajikistan and Mali. Further our troops are engaged in this activity in both Iraq and Afghanistan. Which Congressmen and Senators supported this nonsense for lunatic spendi ng? When was the directive and mission of USAID changed to be a religious outreach program, and why are we restoring these facilities in states who have bases for and support Al Queda? USAID's original mandate was to provide medicines and food. Our elected officials have become so infected with political correctness on both sides of the aisle that they have become completely incapable making sound decisions. We have troops on the ground at war with crippling rules of engagement, in some of these countries and at the same time we are repairing sanctuaries in localities that engage in supporting these un-uniformed proxy terrorist. It is hard to rationally juxtapose this 'cultural heritage' outreach in locales for mosques that give both sanctuary, and comfort to known terrorist organizations identified by our government. In some instances we are doing this 'cultural restoration' in states who actively sponsor the presence of these proxy enemies and have also routinely displayed outspoken hostile intent towards the United States. Worse still we are doing these 'cultural heritage' restorations without these states disavowing the enemy they allow on their soil, and and prior to either a truce or surrender. Both the Marshall Plan to rebuild and stabilize Europe and the plan to also rebuild and stabilize Japan made sense, and were implemented after our adversaries had surrendered. Clearly this is a Catch 22 of lunacy. Where are the usual dependable outcries from those on the left who have near apoplectic fits in their outcry for separation of church and state when it comes to the Judeo Christian tenets upon which this nation was founded? Their silence is deafening. Why we are underwriting the restoration of mosques in other nations any where on this planet? No wonder we are in a quagmire, it has been created by these dicotomies of policy. The idea of appeasment to the Moslem world along with disquising that our taxpayer dollars are being spent on mosques under the cover of restoring historic landmarks reveals two disturbing trends in Washington. One trying to buy off our enemies and win their hearts and minds. Paying ransom never works. Two deception and hypocracy with the American taxpayer creating greater divisiveness (mosque at ground zero) by supporting moslem growth in the United States while attacking Judeo-Christian values from prayer in schools to altering the definition of marriage. In reality our government is using our money to destroy our culture! This is as you say, Melody "lunacy" and Americans must protect American values. One of the problems with a state religion, such as Islam, is that the rest of the world is forced to deal with both a political entity (a state) and religious entity. When dealing with a Muslim country, where are the lines between a state/government action or position and a religious action or position? If the Lutheran faith was the official state religion of the United States, how would other countries know whether some particular policy was being pursued by us for political or religious reasons? The United States is hardly perfect, but one of the many things it did get right was that there would be no state sanctioned religion, creating a tradition that recognizes and respects the seperation of church and state. As people are seeing, the inability to distinguish a political state from religious beliefs is ultimately very dangerous. Consider that at all times there are three major forces or powers acting on all human communities, from the smallest and most primitive tribal communities to large, cosmopolitan countries: the power of money (wealth), the power of government (the power of literal force to coerce other people--i.e., the people with the guns) and the power of moral authority, typically represented by a religion. A few months ago, when one of the national debates was whether terrorists should be tried as criminals or enemy combatants, I was surprised this aspect of Islam as a state religion never came up. My thinking is that, of course, they should be tried as enemy combatants--the guy who murders someone while robbing a 7-11 isn't killing to make a political statement, whereas the whole point of killing for a terrorist is to make a political statement, and that to me seems like a pretty good definition of war, or "enemy combat." Of course, the problem arises precisely because these terrorists are not wearing the uniforms of some recognized country, and are not in the employ of a government per se, but are acting out of a religious fervor that originated with a state sanctioned religion, and in their eyes, acts of terrorism seem to be both a religious and patriotic duty. Again, where do we draw the lines? Do the politics inform the religion, or does the religion inform the politics? Do we jettison a two-hundred+ year tradition of religious tolerance? And if not, do we risk our national security? For me, I think the answer is that we begin to clearly define what we recognize a a legitimate religion, and legitimate religious practices; namely that we don't recognize any religion that violates basic human rights--after all, that's what this country was founded for--we certainly wouldn't recognize a "religion" that practiced ritual human sacrifice as a legitmate religion, even though such "religions" once existed. So, why should we not judge contemporary religions by the same standards of basic human rights? Sometimes it seems to me that some people use religion like some kind of 'get-out-of-jail-free' card. I don't think that religious tolerance means I have to tolerate behavior that violates basic human rights, decency, and dignity. CHill, I post on HE as Fred Wells. very nice post..Thanks for sharing this with us.But can you provide some more detailsfolding chairs?